Ridesharing. Carsharing. Bikesharing. In the "shared economy," shared and for-hire vehicle services are on a roll. But what are the rules of the road for these new services? Planning for Shared Mobility offers answers for communities on the move. This PAS Report, by a pair of UC Berkeley researchers, tracks the path short-term transportation access has taken so far. Authors Adam Cohen and Susan Shaheen look at how shared mobility is shaping — and being shaped by — local plans and policies. The report also shares the tools planners can use to manage mobility, such as zoning, permits, variances, and discretionary review. Profiles of eight cities, from New York to Seattle, show the plans they've put in motion and lessons they've picked up along the way. Sharing wheels is more than a convenience, the authors argue. It can boost mobility, cut vehicle emissions, and create links between walking, cycling, and transit. Ready to move forward? 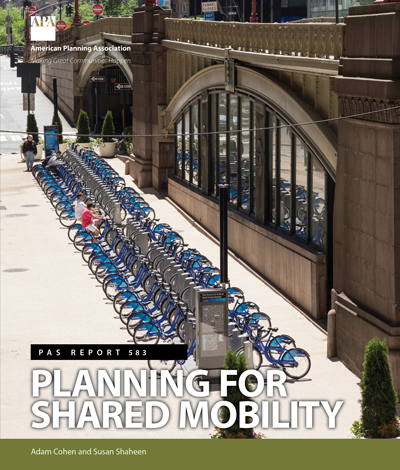 Read Planning for Shared Mobility to learn what's next — and how to roll out the long-term benefits of short-term transportation access. Adam Cohen is a shared-mobility researcher at the Transportation Sustainability Research Center at UC Berkeley. Since joining the group in 2004, he has focused his research on worldwide carsharing, bikesharing, ridesharing, and emerging technologies. He has coauthored numerous articles and reports on shared mobility in peer-reviewed journals and conference proceedings. His academic background is in city and regional planning and international affairs. Susan Shaheen is an adjunct professor in the Department of Civil and Environmental Engineering and a research engineer with the Institute of Transportation Studies at the University of California, Berkeley. She is also co-director of the Transportation Sustainability Research Center at UC Berkeley. She was the policy and behavioral research program leader at California Partners for Advanced Transit and Highways, a special assistant to the director's office of the California Department of Transportation, and the first Honda Distinguished Scholar in Transportation at the Institute of Transportation Studies at UC Davis, where she served as the endowed chair until 2012.